Why I love DuckDuckGo--but don't use it. Home > Forum > General Ramblings > Why I love DuckDuckGo--but don't use it. I like DDG, I really do. I&apos;m worried by the huge amount of information Google et al. collect from their users, and I think it&apos;s wrong to filter search results without people&apos;s knowledge or consent. As an American living abroad, I&apos;ve frequently been annoyed by Google&apos;s bubbling attempts, trying to adjust content to be in a foreign language or from the country I&apos;m in--even when I&apos;m on the US Google website, and have my settings set to English. The thing is, while DuckDuckGo has a great philosophy, it doesn&apos;t work very well as a search engine. I can&apos;t use a search engine based solely on principle; Google gets me what I&apos;m looking for faster and more often. Compare "garbage fetishism" on both search engines. An obscure topic, to be sure, but I&apos;ve found that it&apos;s exactly those obscure topics that make the difference, and those are also the topics I&apos;m likely to want more information on. (In this case, I was looking into sources for a possible Wikipedia article.) Google gives me "Of My Trash Fetish by Trashy Trashbag", on trashcanstories.net. Perhaps a bit more specific than I was looking for, but relevant to my search term. On the other hand, DuckDuckGo gives me "Talk:Asian fetishism/Archive 6" on Wikipedia. Asian fetishism is the wrong topic, and what&apos;s more, this is not a Wikipedia article but an obscure behind-the-scenes page. Google goes on to give me various results that are somewhat related to garbage fetishism, while Duck Duck Go gives results about every kind of use of the word "fetishism", except ones involving garbage. Of course I could make my search more specific, but the point is that Google gave me better results with less effort. Anti-bubble or not, how can DuckDuckGo hope to rival Google if it isn&apos;t as good at fulfilling the primary function? Is DuckDuckGo working on improving search results; should I expect it to get better? DDG is improving, devs are listening more than you can imagine, this very topic will have an impact on the future results, whereas Google even if great is frozen (and in my opinion is getting worse). Why not use DDG and once in a while also use !g to get a second opinion? Looks like this back yard experiment is no longer available, but was a great idea. 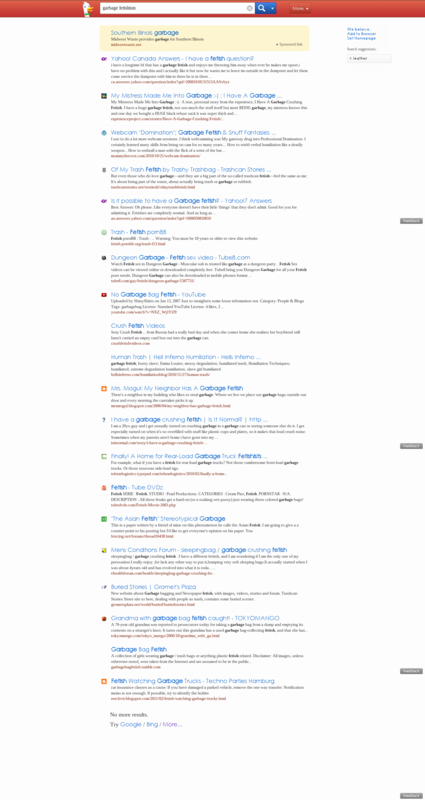 Twingine.com would show google and yahoo results side by side (random which side). I also like the principle of ddg so for those who find it is still missing something, and help them to keep ddg as primary search tool, might I suggest adding a link to alternates, or better still, maybe even run a [bing or whatever] search anonymously and show the results - or is that way too cheeky? What we want is not to be tracked - how you do that is not necessarily best done by trying to replicate the fantastic engine they built. Quite relevant imo, and actually includes the same result you mentioned from google. My only settings are region = world traveler, and safesearch off. I&apos;m curious -- what are your settings? Could very likely be something in there causing this. But when it comes to more specific things I rely on Google. Why? Google&apos;s main business is generating the search results you would expect after entering a search term. They invest millions - if not billions - of dollars in refining every seen and unseen bit of their engine. DDG will never be able to match this. I&apos;ve seen DDG&apos;s results improve a lot over the past few months but there will always that special topic DDG will struggle with while Google gives me what I&apos;m looking for. I think sites like DDG require a certain amount of users to be judged as gaining critical mass, it&apos;s how communities are sustained. By sheer number of people involved, as well as contributors. It will get better over time. I use DDG as my default search engine on Firefox, I use the bang syntax very often, and I also use it for basic, everyday searching. If I don&apos;t find something on DDG, I direct my gaze to Google or Bing. What makes it so hard to compete with Google has already been mentioned. Google has A LOT of information flowing through its systems every minute, through all of its services. It&apos;s pretty worrying, because they may eventually have control over a large part of the world&apos;s information, creating a single point of failure, or a single point for evil to occur. It uses this information to be more relevant (or at least try to be) because that&apos;s how Google makes their money (by relevant advertising). It makes more money when it invests money in being more intelligent. And so the snowball rolls. Competition from Google is inherently good for DDG. As DDG tries to compete, it will eventually get better than Google and do so while remaining on higher moral ground than Google, which would truly be ideal of a search engine. I&apos;ve tried YaCy before (it&apos;s a P2P distributed search engine) but I didn&apos;t stick with it. I don&apos;t have the spare processing power for the crawling, nor do I have the money to pay for the power bills. Both are involved when operating a YaCy node, and I don&apos;t see operating a P2P node of any variety as a "need", rather a "want". So in the end, DDG is the best alternative for me. I&apos;ve set DuckDuckGo as default search engine and don&apos;t see why I need to go back if I can just google with !g (it&apos;s easy to get used to). I assume that the DuckDuckGo developers look closely at &apos;!g&apos; queries in order to improve the results for these types of queries. What&apos;s particularly bad about Google is that it tries to force particular ways of searching down my throat: it redirects me to local sites based on my IP address and it&apos;s hard to just use google.de or google.com in order to check whether other people can find our websites, some things like the language for a search query are just made unnecessarily complicated (and I could go on). Search engines need to put you in control of your searches, not take evidently useful options away from you. Apart from these smaller issues, I&apos;d rather pay the small price of having to do some searches twice than having my complete search history stored at Google forever (don&apos;t belive the privacy theater at such corporations). I&apos;m a novice, and today I&apos;ve added DDG as my default search engine. Previous to this I used YIPPY. Where does YIPPY fall within the scheme of search engines? I have been using DuckDuckGo for many months now, and only about 2 or 3 times have I had to use Google to find something specific. This includes at work, as I work as an IT consultant in a corporate environment. DDG is definitely good enough. I also love the fact that my searches are private. I like the clean interface and simple interface. I really like the fact that I don&apos;t have to click 2, 3, 4 - the results just keep flowing down as I scroll to the bottom. As an alternative to Google, DDG cuts it. Like so many others in this thread, I too use DDG as my primary tool. For 99% of what I need, it works superbly. There are occasions--especially for obscure or long tail queries where I&apos;ll use bang to jump out to google. That&apos;s why DDG has the !bang syntax, though--they understand that, while they are a great tool, they aren&apos;t always THE tool for the job. I would encourage the OP to not be so discouraged because Google is some times necessary. While you might have to step away from DDG on occasion, for most broader queries it&apos;s not just "good enough", it&apos;s the best. I wonder why you don&apos;t just add a parameter to your search, like !g (or !gi, !gn, !yt) whatever environment you want your results from. You still get no tracking and unfiltered results. Or is it me missing something ? DuckDuckGo&apos;s privacy and no filtering policy only applies to the DuckDuckGo website. Using !g is like using Google normally. Thanks for the clarification, I had no idea. I don&apos;t see how that&apos;s even possible though: shouldn&apos;t cookies or unique ID&apos;s being involved ? How would a ddg webpage end up using those ? I would agree with much of the above. I started using DDG as a principle, but then found it fell short on specific or obscure searches. When you compare the results, you really appreciate that G is much better at that stuff. Now I adopt a two-pronged search approach: if I&apos;m looking for something fairly easy and obvious (like the website for Acme Hinges of Tulsa, OH), but for which I don&apos;t know the URL, I type that into DDG; if I&apos;m looking for something obscure (the answer to a question or a more obscure research topic), I&apos;ll use G. So I see DDG as "hunting" (shooting at the obvious target) and G as "fishing" (uncertain what I&apos;ll catch). I also use DDG as a site search box for my own sites, which works very well..... Chris, UK. If you keep supporting DDG it can keep improving itself. The best reason to support it is for a free, relevant, less influenced by the big money internet. I also noticed that Google is sometimes more precise of DuckDuckGo. Indeed, I also search with StartPage. However, However, I hope that DuckDuckGo will get better! I wanted to search online for people&apos;s experience with this anti addiction drug. I searched for "no addiction powder" on Google and all I found was pages upon pages of sales websites and advertisements for the product. Then I tried DuckDuckGo and one of the most relevant links was in the 6th result. So, I am going to use more of DDG after months of NOT using it because I thought Google was somehow smarter. DuckDuckGo is a feature-rich semantic search engine, that gives you countless reasons to leave Google behind. Searches are divided into a classic search, information search, shopping and their own spin-off from Google, "I&apos;m feeling ducky." I don&apos;t care if google gives better results I quit google first time I heard about DDG. I only use DDG now and I haven&apos;t looked back since, I almost even forget that google search engine exist at times. I hope DDG also expand their privacy brand further in the future! I tried DDG last year and forgot about it as the results weren&apos;t relevent. Just tried it today again and I am really impressed. I will be trying ddg first and see how things go. If you notice any poor relevancy, please use the Give Feedback button to the right of the results. From there, you can anonymously submit your query for relevancy review. Old not configured optimased ´Leathal.. I use duck duck go almost exclusively. but when I want something relevant to my location or in Spanish I use Google. Same here I agree ... The Irony is I looked up this topic from google and Duck go go .. In Google it showed me this forum and many simmilar topic .. On Duck go go didn't even show the forum. The project is sound and I get they don't have the same ammount of resources .